Anyone hoping Treasury rates will ease, cutting stock-market bulls some slack, must first reckon with the chart shown (see inset). It implies that a significant rise in yields on the 30-Year Bond is coming, and that they will hit 3.59% before borrowers get any relief. If this occurs as appears likely, 30-year mortgages will be pushing above 5%, causing an already shaky housing sector to implode, along with the auto-leasing business. A key resistance to watch sits at 3.44%. 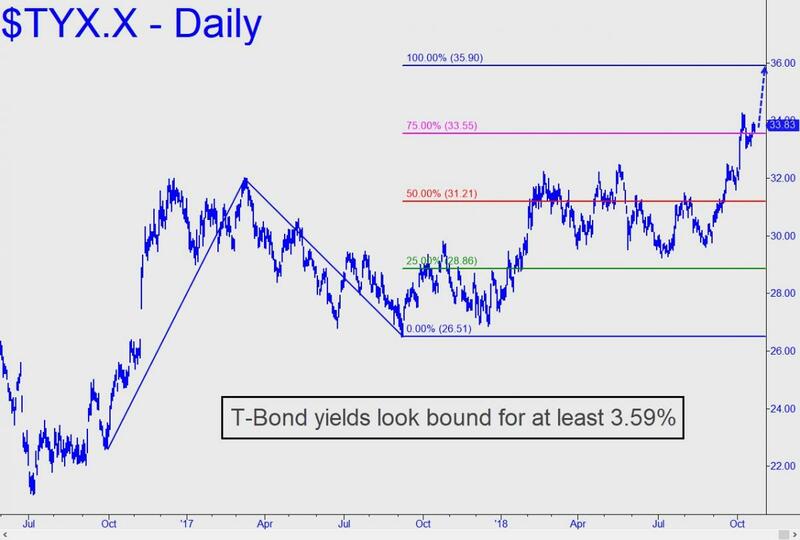 That’s a Hidden Pivot rally target of lesser degree than the one noted above, and if it gives way easily there should be little doubt that the long bond is on its way to at least 3.59%. Some may point out that the U.S. economy has survived much higher rates; however, that should come as scant comfort, since rates have never risen so sharply after having been artificially held so low for so long. As to Fed hubris that would have us believe the economy is strong enough to weather higher interest rates, the banksters will discover otherwise — discover that most of the supposed ‘strength’ has come from stock-market and real-estate valuations pumped to the sky by easy credit fostered and promoted by the central bank.